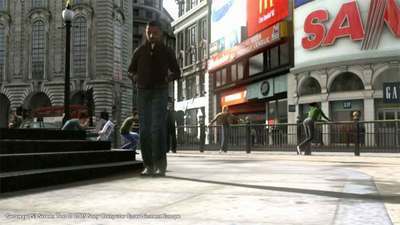 The Getaway originally appeared on the PlayStation 2 recreating a 3D rendition of London covering approximately 10 square miles (16 square kilometers ). The team produced a wire frame model based on a photographic survey of London and then projected the resulting textures onto the geometry. The game is viewed from the street level allowing some simplification of buildings. In a write up for the BBC Senior producer Peter Edward mentions that "The street sites are like a western movie. They don't have wooden slates at the back but they are just the fronts". This is the easiest (if easy is the word) way to rapidly create geometry by ignoring the overall building footprint and pasting on rectified images to create facades. It continues to amaze me that some of the best simulation and computer graphics technologies are developed for games. I guess I'll have to wait for the game to find out what game plot required such realistic renderings - or, maybe this is just an outlet for some urban simulation researcher who found good R&D money at a game company?